The Space Atlas is your guide to the 28 star systems of the Old Frontiers Sector. On the edge of explored space, you'll find the bazaars of Bollux, the rival religious fanatics of Bannar and Drayhoah, the carnivorous plants of Talisman . . . adventures galore. Each world description includes a complete Planetary Record Sheet, with an overview of the whole star system and a detailed description of the planet itself, using GURPS Space format . . . planetary map, atmosphere and gravity, day and year length, population, government, resources, economy, biosphere and special features. Some worlds include descriptions and game statistics for people, animals, plants or vehicles found on that planet. Adventure suggestions are included for every world. The Space Atlas is designed to fit into any campaign. You can use the worlds together (maps of the whole Old Frontiers sector are included), or choose individual worlds and fit them into an existing campaign. The book's introduction includes historical and background information to fit the Corporate Worlds into four different universes: Anarchy, Alliance, Federation, or Interstellar Empire. 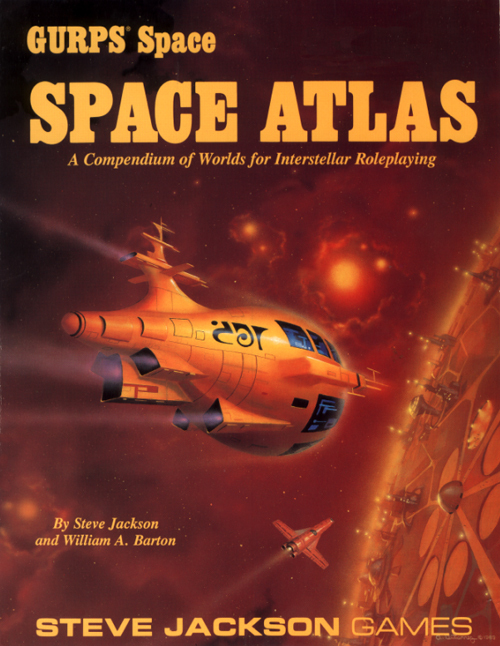 The Space Atlas is designed specifically for GURPS Space, but can be used by the GM of any interstellar roleplaying campaign.